The oranges* from our organically grown trees are now ripe and they are truly outstanding. Last year we harvested over 1,700 oranges. Each morning we are juicing them for our guests. We will finish harvesting them in about two weeks and will have hundreds refrigerated. We will likely be juicing them well into April. Come and enjoy! * For more information on Ambersweet oranges click on “Ambersweet oranges” under Blogroll to the right. I use rainy days in a special way in my garden. Just before the rain comes I sow seeds and transplant seedlings. With this last rain I threw out sorrell seeds and transplanted four different kinds of lettuce, a wonderful butterhead, a miniature romaine, a lovely red lettuce called merveille saisons, and a bibb lettuce. We have one head of bibb left from the last planting. Add a touch of arugula, a tossing of frozen sweet English peas, a powdering of freshly grated parmesan, and a squeeze of lemon to any of these lettuces and I get a delicous, delicately nutty flavored salad. A sliced green onion and a couple of sliced radishes add pizazz as well. I’ve had some good luck even in this drought. 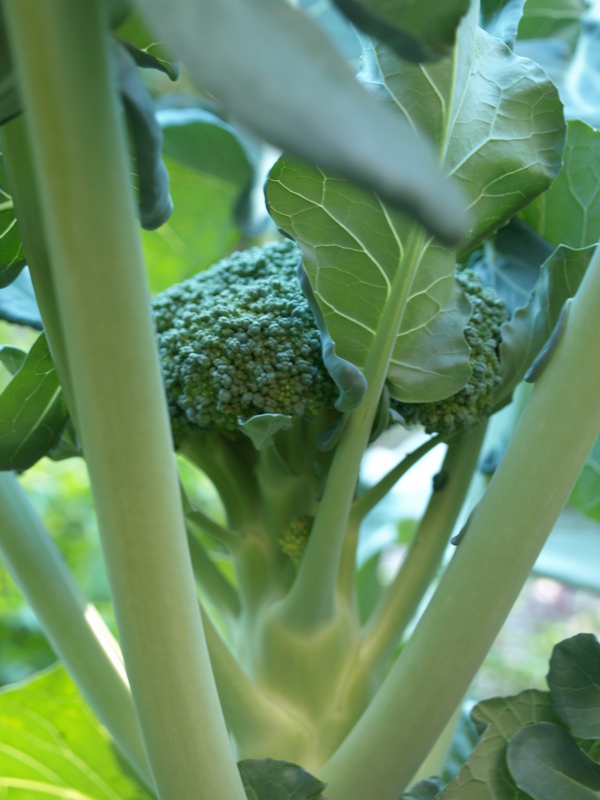 My broccoli headed up beautifully and is now throwing out delicious side shoots. I like it raw–so sweet. But steamed just until the last of the crunch is left is great as well. I grew turnips for the first time and got real turnips along with the greens. I have trouble with food that’s supposed to grow under the ground. Getting radishes and beets to round out seems to be a challenge for me so this is a real triumph. Roasting a chicken on a bed of turnips does wonderful things for both the flavor of the chicken and the turnips. Stuffing the chicken with the greens makes a flavorful chicken broth or gravy as well. Most exciting of all, we found a place in the garden to grow spinach where the bugs don’t grow. The first batch grown in a dangerous spot looks like green lace but I’ve actually gotten two meals out of this second batch: one for Tom and me and one for our guests. Rub the spinach with some finely grated garlic and barely wilt it in hot olive oil. It tastes great as a side or layer it in a fluffy omelet with a smidgeon of cheddar cheese for a delicious breakfast. The stunning dark green of the spinach makes any plate of food more beautiful. Gardens need consistent care to be really productive.That’s probably why my first attempt at growing fava beans has not been successful. They have produced lot’s of blossoms but no beans. I think they probably needed more feeding and definitely more hand watering. I’m going to try them again sometime because I have some great recipes for them. I’ll just have to remember those waiting recipes the next time I want to take a siesta instead of hoeing a garden bed.